Its been more than 2 years I’ve been experimenting and working with Drupal. Being a windows user and not being able to get into CVS and things I’ve not contributed any code to the Drupal Community :-( though I want to. Now I even lack time to contribute but its not that I’ve not contributed anything. Module development I’m just trying my hands onto it but I’ve written most parts of the Drupal how to which is quite popular and this blog of my has lots of Drupal related posts, some 18 of them already. 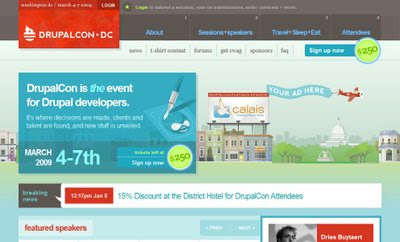 I came to know about Drupal Con(s) and other trainings by Lullabot , via the podcast at Lullabot and badges like the one you see on the right. Listening to the Drupal podcasts (when the light goes here in Kathmandu, thats quite ofter now 14 hours/day ) I’ve a feeling to go to these confrence, trainigs or other sessions to learn more about Drupal. Drupal is a life changing experience, think a tool/software that could enable you to build a simple website in matter of hours than days or weeks. Hearing Jeff Robins , publicizing about the books, dvd, events and trainings of lullabot I really want to attent such a confrence or training but sadly it won’t be any time sooner as they don’t even consider Asia as a destination for such things why come to Nepal. And yes there may be 100 more reasons not to do a conference or event here.